The Great Hunt captured my heart last year. It was a beautiful story, filled with awesome characters and great adventure. I have been looking forward to this book ever since, but of course there was some of that fear we bookish people have... that the story won't still hold its magic. I shouldn't have worried. The Great Pursuit was full of the same awesome, with a little extra thrown in! The story starts immediately following the events of The Great Pursuit, with the horrible news that there is another beast roaming the kingdom. But this time around, things are much, much worse. This time, there aren't enough soldiers for another hunt. So many were killed during the first Hunt, the king and his council aren't sure how to fight this new threat, yet they aren't willing to follow through with throwing out the Lashed laws. And so begins a fast-paced thrill ride. Princess Aerity is set to marry the Hunt's winner, but her heart won't let Paxton go. Paxton is off on a journey of his own, to forget Aerity and find a life for himself where he doesn't have to hide. And Rozaria is building an army of Lashed, becoming more of threat than anyone could have dreamed. Everyone that I fell in love with in book 1 is back in book 2, and better than ever. We meet some new people that add another layer of richness to the story. And romance! Let me tell you, the romance (or I should say ROMANCES) in this one will make your heart pitter-patter! 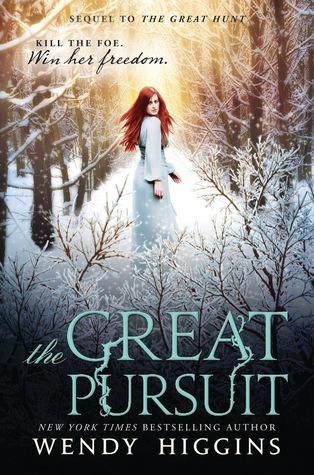 The Great Pursuit was everything that I had hoped it would be and so much more. Wendy Higgins has easily become an author that sticks on my top list. The only problem that I have is that there isn't another story coming from this wonderful world. A duology is awesome, but really?! Is it!? At least we are left with a beautiful ending to a story that was deserving of a beautiful ending!